Changing your home may seem like a daunting task, but there is no need to be overwhelmed. A complete face lift for your home is achievable by updating many different facets, but especially via exterior painting. 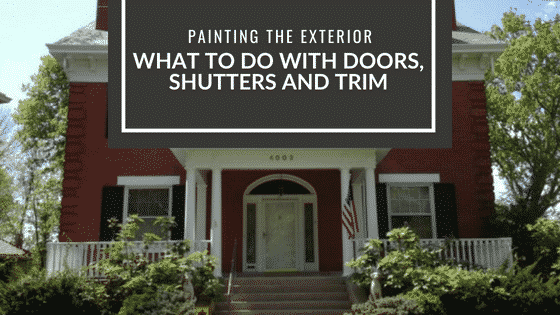 In this post we will be explaining the process of painting the exterior of your house by categorizing the tasks into doors, shutters, and trim. These projects are inherently smaller and more manageable, and can be easily incorporated into your restoration plan. And while you may not be an artist, color play is a crucial part of any type of home project. All visible assets should be considered in relation to each other, otherwise known as a complimentary color palette. We will discuss the importance of color selection in regards to the style of your home to ensure maximum aesthetic appeal. Lastly, we will review the type of paint you should use for each project, as it determines the longevity of the renovation and the appearance the paint job will have. The doorway is the first impression your home makes on a guest. It is the focal point of your abode and can make or break the visual balance of the appearance your home. Depending on whether you have a glass door, wooden farm door, or paneled door, the color choice should differ. A recent trend in exterior decorating has been bold red doorways make a statement juxtaposed to monochromatic panels. If you are not interested in bright cherry reds, a subdued maroon or crimson make an elegant and more muted alternative. For paneled doors, rich mahogany stains and hunter greens are excellent as they act as more of an optical border. Shutters can be visualized as the “picture frames” to your windows. They are often overlooked during the initial impression of your home as they are not the main attraction; however, they act as the frame to its entire appearance. Have you ever seen a home without them? It looks empty…even if it has a bright red door. Depending on the color of your exterior siding, these pieces are best kept on a muted color palette. Because each window has one on each side, bright colors can quickly become overwhelming and crowed. It is suggested to keep the front door the most eye catching color and use browns or blacks for other elements. Where the front door is the standalone feature on the front of your home, the shutters are the “picture frames”, the trim serves as the “wrapping paper”. It generates the less-noticed outlines that create depth and illusion to your property. It should not be an identical color to the house, as it is imperative to give a sense of three-dimension to the doorframe and outline exterior. The main takeaway about this paint job is that it should be in contrast to the color of the siding. For instance, if your house is white, a black choice would be excellent as they are opposites of each other on the color spectrum. It allows the eye to fully see the shape and angles of the architecture. If your home is brick, you are given more opportunity to do atypical trim colors such as forest green or whites. When painting the exterior parts of your home, different paints must be taken into consideration. Glossy finishes are best for doors as they command a lot of attention. They look excellent when used for bold colors. Weather proof or more durable finishes are suitable, as they can withstand the elements for over a decade. Satin finishes are not often used for outdoor projects, but make an excellent choice when used for internal baseboards and frames. If you are confused on which type of paint to select it is best to go to hardware store for swatches you can place in your home. The color of your home and its features will most likely change with the times. But at the end of the day it does not matter what color, style, or size your home is because what makes a house a home is you!